Le Tour de France Official Race Headquarters ship. If you can’t make it to Maui for the Cycle to the Sun Ride up Haleakala, join millions of other cyclists around the world celebrating the 100th running of the famed Tour de France cycling race! To get ready for my trip to Europe for the cycling event of the year, before departing Maui I compiled a list of information about the Tour de France. Though I’m here representing cycling on Maui and West Maui Cycles bike shop, the list below should help you enjoy the tour almost as much as being here! The world’s best riders and cycling teams from around the world have already arrived on the island of Corsica and a ship has been commandeered as the headquarters for the Tour de France officials and press. The cyclists are housed elsewhere around the starting point. Read more and watch our Facebook page for updates from the race over the weekend or afterwards. 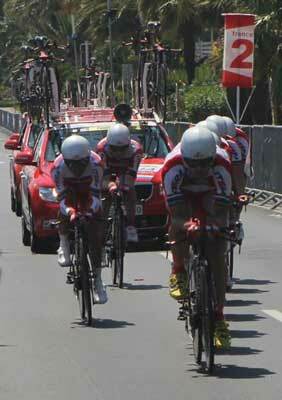 Bikes in Tour de France image. When – The first stage of the race begins on Saturday, June 29 in Corsica. 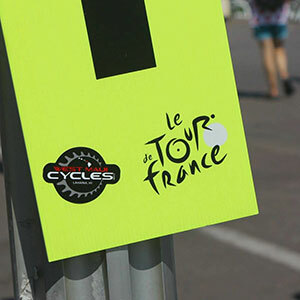 The last stage of the 2013 Tour de France bicycle race finishes in Paris, France on Sunday evening, July 21. Route Map of the 2013 Tour de France Cycling Race. Distance – 2,088 miles or 3,360 kilometers is the total distance. Where – Throughout France, of course! 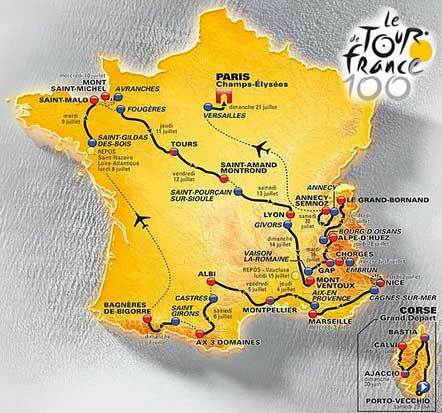 Take a look at the 2013 Tour de France Map pictured below for more details of the route. Or, take a look at the interactive map on the Official Tour de France website. Course Route Overview – See the Tour de France Map for complete details of the Tour de France route and details for each stage of the race. The 100th running of the Tour de France begins on the island of Corsica on the 29th of June. After the 22 teams of 198 cyclists Grand Depart of 2013 from Porto Vecchio, the first stage will be a sprinters delight! With the Tour making it's inaugural appearance in this region of France, the first 3 stages of the 2013 the Tour de France will take place on the island of Corsica before the cyclists transition to Nice on the French mainland for Stage 4 where they’ll compete in the first team time trials. The start of the 100th Tour de France on Corsica. Next, cyclists make their way on Stage 5 riding through breathtaking scenery in the south of France with a finish at Marseille in the second longest stage of the race. Stage 6 on July 4 and Stage 7 conclude another 238 miles of riding when the riders finish up in Albi before climbing Stages 8 and 9 in the Pyrenees Mountains on Saturday and Sunday, July 6 and 7. The riders take a break on Monday the 8th before undertaking the 122 mile flat Stage 10 ride beginning in Saint-Gildas-des-Bois and ends at Saint Malo. Stage 11 consists of two individual time trials on the 10th of July before another mostly flat Stage 12 ride covers the 135 miles in western France on Thursday, July 11. Stages 13 and 14 burn through another 226 miles with a couple days of hard climbing to Lyon before the long 151 mile stage 15 ride on Bastille Day, July 14 finishes with the grueling climb up Mont Ventoux. Cyclists rest on Monday, July 15 before the Tour de France resumes on Tuesday, July 16, for the 104 mile 16th stage ride followed by time trial Stage 17 on July 17. Difficult altitude climbing in the Alps will be featured in stages 18, 19 and 20. On Sunday, the 100th Tour de France cycling race comes to a finish with the 83 mile Stage 21, riding from Varsailles to the finish line at Paris Champs-Elysees after a ride around the famed Arch de Triomphe with an evening finish at dusk in the City of Lights! Stage 8 – Castres to stage finish at AX-3 Domaine in the Pyrenees. Stage 15 – Fitting for the Bastille Day stage, the stage includes the most difficult climb of the 2013 Tour de France! The day of cycling begins in Givor and the stage finishes at Mont Ventoux. This stage features a a finish with an 11% grade at the summit and riders are likely to find the section similar to what cyclists endure on a bike climbing Haleakala on Maui! Stage 18 – Gap to stage finish at Alpe-D’Huez. Stage 19 – Bourg-D’Oisans to stage finish at Le Grand Bornand. Television Coverage – Much of the 100th running of the Tour de France will be televised on NBC Sports TV, beginning with the start in Corsica on June 29 and ending with the finish on July 21 in Paris at the Champs Elysees and Arc de Triomphe. All stages of the race are being live streamed on NBCSports.com. Did you know the Tour de France is the third most watch sported event worldwide, just behind the Olympics and the FIFA World Cup Soccer matches? Time Difference Between Maui and France - 12 hours. When it is noon here on Maui, it is midnight in Paris. Set the DVR so you don't miss any of the cycling action! 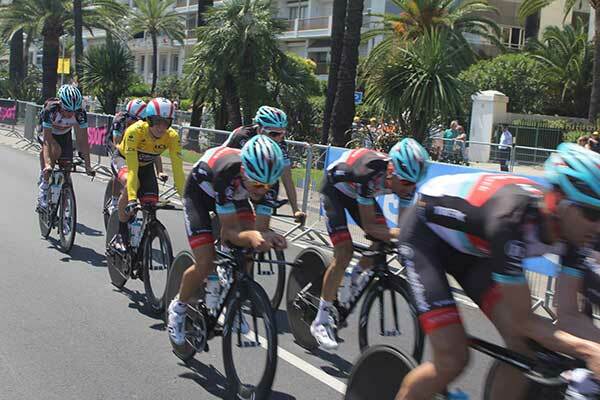 More Resources for the 2013 Tour de France - Review this comprehensive daily highlight summary of what to look for at the 100 th running of the Tour de France by Gayle Falkenthal for Communities Digital News at Washington Times. See pictures of the riding routes and read more about the Mountain Stages of the 2013 Tour de France on the Podium Café at SBNation, where some of the above information was referenced from.